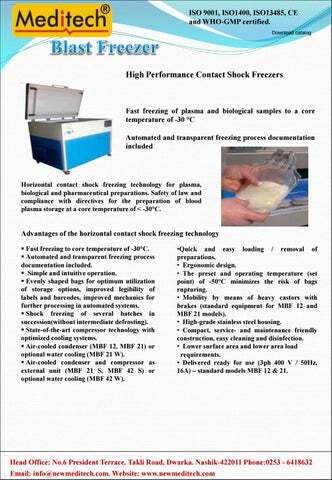 Horizontal contact shock freezing technology for plasma, biological and pharmaceutical preparations. Safety of law and compliance with directives for the preparation of blood plasma storage at a core temperature of < -30°C. Advantages of the horizontal contact shock freezing technology  Fast freezing to core temperature of -30°C.  Automated and transparent freezing process documentation included.  Simple and intuitive operation.  Evenly shaped bags for optimum utilization of storage options, improved legibility of labels and barcodes, improved mechanics for further processing in automated systems.  Shock freezing of several batches in succession(without intermediate defrosting).  State-of-the-art compressor technology with optimized cooling systems.  Air-cooled condenser (MBF 12, MBF 21) or optional water cooling (MBF 21 W).  Air-cooled condenser and compressor as external unit (MBF 21 S, MBF 42 S) or optional water cooling (MBF 42 W). •Quick and easy loading / removal of preparations. • Ergonomic design. • The preset and operating temperature (set point) of -50°C minimizes the risk of bags rupturing. • Mobility by means of heavy castors with brakes (standard equipment for MBF 12 and MBF 21 models). • High-grade stainless steel housing. • Compact, service- and maintenance friendly construction, easy cleaning and disinfection. • Lower surface area and lower area load requirements. • Delivered ready for use (3ph 400 V / 50Hz, 16A) – standard models MBF 12 & 21.